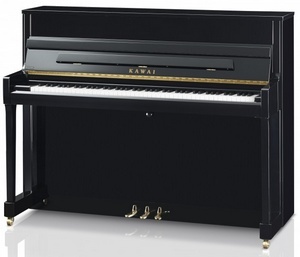 The Kawai 'K' series upright pianos are engineered to produce a superb sound and ultra-responsive touch, and are built to give extraordinary performance over many years of rigorous use. With outstanding tone and touch, the NEW K-200 offers the dependability and character needed to please any performing pianist from the novice to the seasoned professional. 7¼ octave keyboard. 3 pedals (½ blow, practice and sustain). Overstrung with a full iron frame. 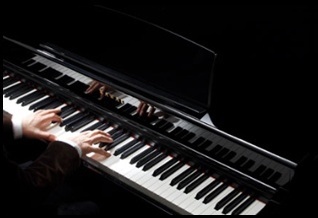 Exclusive Millennium III under damper Upright Action with ABS-Carbon Composites, as used in the EX and SK concert grand series. 1.34 m2 solid spruce tapered soundboard. Double felted, mahogany core hammer. Hard maple wrest plank. Nickel plated wrest pins. 4 post braced back. Single brass front castors. Available with Chrome fittings (to order) and as 'Anytime' version. Height = 114 cms. Width = 149 cms. Depth = 57 cms. Prices include VAT, 5/5 year guarantee, 1st tuning, and delivery within 25 mile radius of Dairy Lane and to ground floor. Prices, specifications and model names are subject to change without notice.